I don’t know about you, but when I think of summer a few things come to mind: spending time on the beach, drinking ice cold beer, and eating a slice of sweet watermelon. Landing all three of those in one day is what I call a summer time hat-trick. Finding a warm beach and a cold six-pack is something most everybody can do, but I find that one of the questions I get asked most at my store is how to pick a good, sweet watermelon. Truth be told, most people I see buying watermelons just grab the top one in the bin and never so much as give it a good once over. Then they complain that it was mealy, flavorless, and un-enjoyable. Have no fear though, after reading this, you’ll be able to pick the best watermelon every time. There are three easy steps to picking a ripe, sweet watermelon. Step 1: A watermelon should be heavy for it’s size. 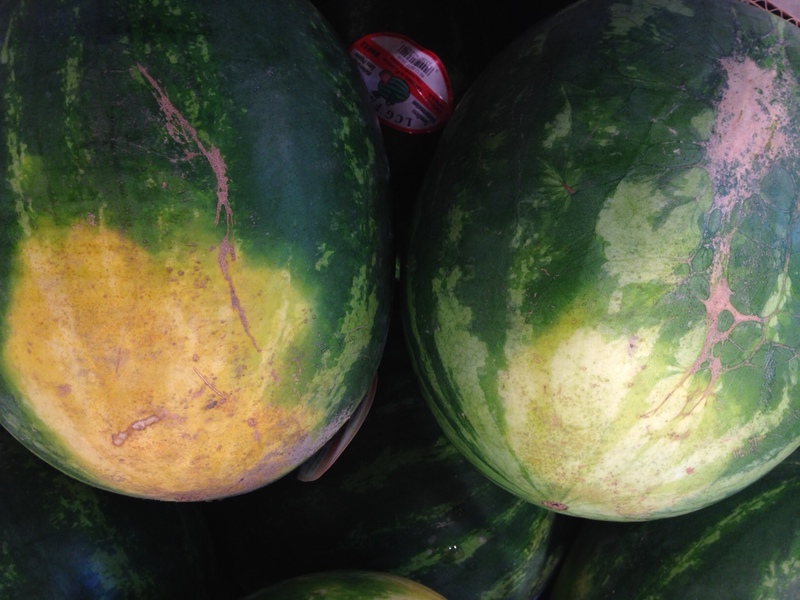 Watermelons are typically sold by the each and not by the pound, so don’t worry about paying more for a heavy melon. When a melon is heavy for it’s size it means that it’s typically a juicy melon with dense meat. Step 2: Look for the field spot. Every watermelon will have a field spot. This is where the melon has been resting on the ground. The field spot will range in color from a pale white to a creamy yellow, and this color will determine the sweetness of your melon. The creamier and darker the yellow of the spot, the better! A yellow field spot means a sweeter and more mature melon. I never buy a melon without a yellow spot. In the picture to the left, the left watermelon has a good field spot and the one on the right does not. Step 3: Thumping the melon. Most people know about this step, but are shy to do it. I’ve seen people give a light tap on the melon or knock on the melon as if they were trying to silently knock on a door. However, you’ve got to give your melon a good thump- be confident. I take my forefingers and slap the broadside of the melon a good 3 or 4 times like I’m burping a baby. When you thump the melon you’re listening for the sound that it creates. A good melon will have a hollow sound. A bad melon will have a dull thud. Most melons that have a dull thud will also be a little soft to the touch and therefore have mealy textured fruit. A good hollow sounding melon will have firm fruit- much more preferred. Pretty easy huh? Now you can count on getting a sweet, flavorful watermelon this summer. So go buy yourself a six-pack and find a sandy beach somewhere and get yourself a summer time hat-trick.